Rashid Bashir completed his Ph.D. from Purdue University in Oct. 1992. From Oct. 1992 to Oct. 1998, he worked at National Semiconductor in the Analog/Mixed Signal Process Technology Development Group, where he was promoted to Sr. Engineering Manager. At National Semiconductor, he successfully participated in and led the development and commercialization of 4 analog semiconductor process technologies. 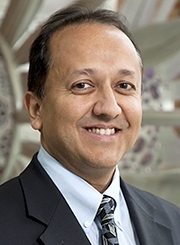 He joined Purdue University in Oct. 1998 as an Assistant Professor and was later promoted to Professor of Electrical and Computer Engineering and a Courtesy Professor of Biomedical Engineering and Mechanical Engineering. At University of Illinois at Urbana-Champaign from Oct 2007 to Aug 2013, he has been the Abel Bliss Professor of Engineering, Professor of Electrical and Computer Engineering & Bioengineering, Director of the Micro and Nanotechnology Laboratory, a campus-wide clean room facility, and Co-Director of the campus-wide Center for Nanoscale Science and Technology , a collaboratory aimed at facilitating center grants and large initiatives around campus in the area of nanotechnology. He is now the head of the Bioengineering department since Aug 2013. He has authored or co-authored over 200 papers, over 160 conference papers and conference abstracts, over 100 invited talks, and has been granted 37 patents. He is a fellow of IEEE, AIMBE, AAAS, APS, and BMES. His research interests include bionanotechnology, BioMEMS, lab on a chip, interfacing of biology and engineering from the molecular to the tissue scale, and applications of semiconductor fabrication to biomedical engineering, all applied to solving biomedical problems. Prof. Bashir's key technical contributions and achievements lie in the area of BioMEMS and biomedical nanotechnology, especially in the use of electrical- or mechanical-based label-free methods for detection of biological entities on a chip. In addition, he has also made key contributions to 3-D fabrication methods that can be used for tissue engineering and development of cellular systems. He has been involved in 2 start ups that have licensed his technologies (BioVitesse, Inc. and Daktari Diagnostics ). In addition to leading his own research group, he is the PI on an NSF IGERT on Cellular and Molecular Mechanics and Bionanotechnology (2009 - 2016) and PI on an NIH Training Grant on Cancer Nanotechnology (2009 - 2016). He is also the Co-PI and UIUC campus lead on an NSF Science and Technology Center on 'Emergent Behavior of Integrated Cellular Systems' (headquartered at MIT, with partners at Georgia Tech and UIUC), Deputy Director of NSF Nanobio Node of the NcN (Network for Computational Nanotechnology), and was a Member of the Executive Committee of the NSF Nanoscale Science and Engineering at Ohio State University. He also serves on the external advisory board of the NIH-funded BioMEMS Resource Center at Harvard/MGH and the NIH-funded Center for Cancer Nanotechnology Excellence at Stanford University, and on various editorial boards.